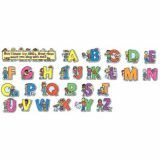 26 6" x 5 1/2" die-cut letters. 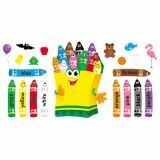 "Now I Know My ABCs" header and resource guide. 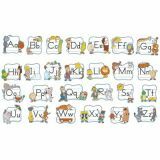 Each set includes 26 alphabet pieces, approximately 4" x 4 1/2" to 4 1/2" x 7", 52 yellow word cards (2 words for each letter of the alphabet), reproducible badge and bookmark patterns. 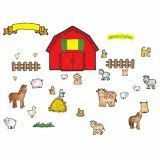 Includes a 31" x 21" barn, 30 farm animals stick puppets, pasture piece, and a four-page teacher guide. 35 pieces. Big tree, 46" x 70" assembled. 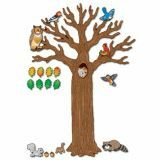 10 animal accents, 79 leaves and 24 acorns. Resource guide. 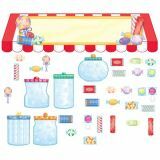 Features a 29 1/4" x 7 1/2" awning to use as a sign, 5 candy jars, 56 candy pieces, and a four-page teacher guide with reproducibles. 63 pieces. 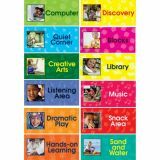 Children who can't yet read easily identify centers by the colorful photographs on each sign. 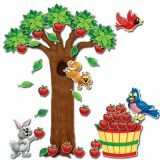 Set contains 12 signs 17" x 7 3/4". Reproducible badge and bookmark patterns. 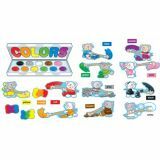 11 color mice with paint brushes, largest approx. 12 1/2"x 15 1/4". 11 color words. 3 color blobs demonstrating the mixture of primary colors to achieve secondary colors. Colors header and resource guide. 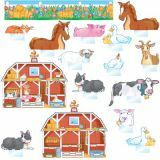 Includes barn (approximately 30" x 28"), 28 farm animals, 2 fence pieces, 4 grass clusters, haystack, feed bag, blank header, and "Welcome to the Farm" overlay sign.